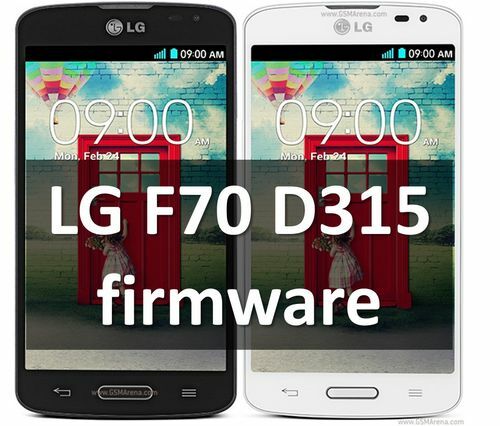 Here you can find details about smartphone LG F70 D315, firmware and tutorial how to install it. Please note, you should use firmware for your region and phone model. First, let’s recall main features of LG F70 D315. The smartphone from South Korean manufacturer was released in 2014. LG F70 D315 used very modern specifications and technologies at that time. It works on latest Android 4.4 KitKat, and quad core processor clocked 1.2GHz. The smartphone sports 4.5-inch display with WVGA resolution. The battery capacity of 2440 mAh provides good battery life on single charge. Also, LG F70 D315 has 1GB of RAM and 4GB of internal storage. However, the main features of smartphone is LTE and software, for example, Knock Code. Of course, now it seems very weak, but three years ago LG F70 D315 was very good smartphone. So, many people use it to this day. You can meet a lot of people around you with LG F70. Because high popularity of smartphone, Korean manufacturer released updates for it for a long time. In early 2017, the last update was released for European countries. Use this link below to download LG F70 D315 Firmware. There you can find full list of LG F70 D315 firmware. Also, you can read our tutorial how to install kdz. We think it can be useful for those, who don’t know about flashing LG smartphones. If you have any questions about LG F70 D315 firmware, use comments form below to write us.